Online video platforms and web video have exploded in popularity over the last five years. Recently Youtube announced that over a billion hours worth of content is watched on Youtube per day. In fact, recent estimates predict that 80 percent of all consumer Internet traffic will be based on the streaming of or downloading of video content within just two more years. Each video-sharing platform comes with its plus and minus points. 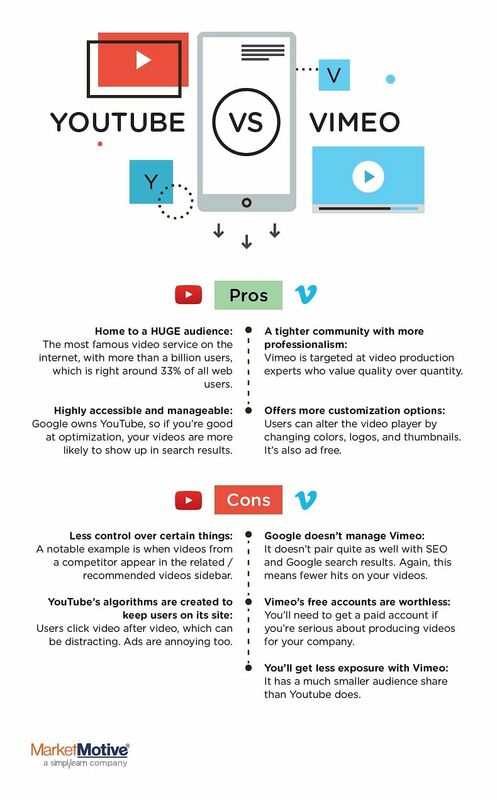 The infographic given below lists the pros and cons of Vimeo and YouTube. Producing videos to connect with your audience and grow brand recognition requires a strong foundation in the principles of digital marketing. It also requires a video platform to host your videos. Unfortunately, there are hundreds of video hosting sites and platforms out there. So, how on earth are you supposed to choose the best one? Currently (and for the foreseeable future), two of the most dominant platforms are YouTube and Vimeo. You’ve probably heard of both of them, yet if you’re like most people, still have questions regarding which platform is a better fit for your needs. Each has its own advantages and disadvantages, which is why it’s important for you to fully understand the differences between them before choosing one over the other. So, with that in mind, let’s break down the pros and cons of both Vimeo and Youtube. We’ll start with Youtube, the Google-owned web video giant. It’s home to a HUGE audience. YouTube is the most famous video service on the Internet, with more than a billion users, which is right around 33% of all web users. If you’re hosting your videos on Youtube rather than another service, you’ve got better chances for exposure. YouTube is highly accessible and manageable when compared to other video services. Plus, it ties directly to your Gmail account. Oh, and let’s not forget that Google owns YouTube, so if you’re good at optimization, your videos are more likely to show up in search results. YouTube is more open than Vimeo, so you’ll have less control over certain things. A notable example is when videos from a competitor appear in the recommended/related videos sidebar. YouTube’s algorithms are created to keep users on its site so that they click video after video, which can be distracting. Ads are annoying too. Let’s move on to Vimeo. A tighter community with more professionalism. Vimeo is targeted at video production experts who value quality over quantity. This image could help your marketing strategy, depending on your goals. The atmosphere is also a little less caustic, as Youtube’s current algorithms can make comment sections pretty dismal places to be. Vimeo offers people more customization options. Users can alter the video player by changing colors, logos, and thumbnails. It’s also ad-free, so your audience is never going to be distracted from the content of your video. You’ll get less exposure with Vimeo since it has a much smaller audience share than Youtube does. Google doesn’t manage Vimeo, so it doesn’t pair quite as well with SEO and Google search results. Again, this means fewer hits on your videos. Vimeo’s free accounts are basically worthless if you’re serious about producing videos for your company. You’ll need to pay for it if you’re going to get any real use out of it. Both sites have robust search engines, and they’ve got their differences. Vimeo search has several elements to its internal search algorithm that YouTube doesn’t have … which may or may not be an advantage. The default is “relevance”, but you can sort videos other ways. In Vimeo, the default sort is also “most relevant”, so to that extent the algorithms are similar — but YouTube ignores comments, while Vimeo factors those in. Why is that? YouTube has good reasons to ignore comments: because most are pretty juvenile. The Vimeo community seems to be populated by more creative types. 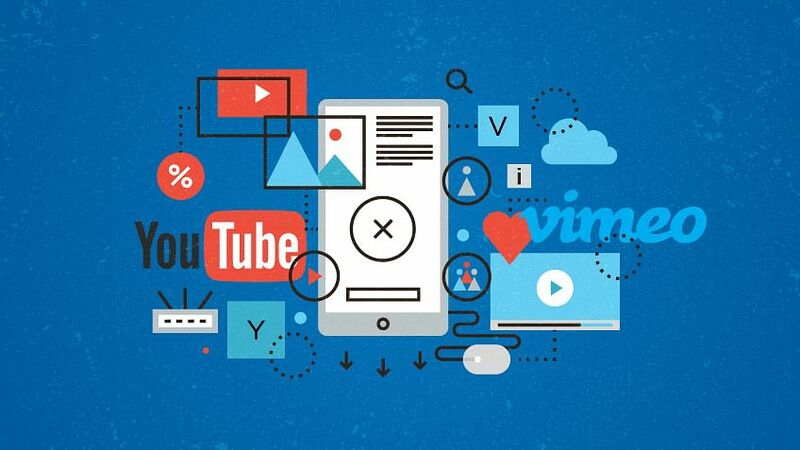 It’s true if you’re trying to optimize videos for Google universal search, Google will show videos from Vimeo as well as videos from YouTube in its results. Of course, there are significantly more videos uploaded to YouTube, which is why Google tends to display significantly more YouTube videos in universal search results. You can learn more about improving your video’s ranking by enrolling in our Advanced SEO certification course. In fact, according to the latest data that I saw from Hitwise, the ratio was 86 to 1 (YouTube to Vimeo). So, your client won’t be handicapped by solely using Vimeo. The Vimeo video will show up. But your client will probably be outnumbered by competitors who understand the value of YouTube. If you have the resources to use both, the answer to this question is simple. You’ll wind up with more exposure, and more options for fine-tuning your marketing strategies and content to different audiences. If your resources are more limited, however, you’ll need to be more discerning. A good guideline is to ask yourself what your goal is with your videos. Is it simply to reach as many eyeballs as possible with your content? If so, use Youtube. If you have a more targeted message you’re trying to get out there to a niche group of people, you’re better off using Vimeo. At the end of the day, they are both great resources. You just have to make a list of your goals, and then make an educated decision from there. hello,most probably people goes for youtube .but what you had provided in the article, that also had worth.I’ll definitely try.if possible can you please provide notes for that.